See how organisations measure and improve engagement and collaboration with tools like Yammer and Facebook for work. Rather than just measuring likes and comments, understand how to evaluate true outcomes and locate the informal community leaders and influencers in your organisation. Cai will share the benefits different types of organisations are achieving , and how they are adapting for the future. Unfortunately I did not hear this session from the beginning but from what I heard I was impressed. The tool is installed on top of Yammer or Workplace by Facebook and gives information about the usage of these tools. about each person. This way you can spot the engaged people and those that needs help. Cai also could tell us, that the women generally participated more than men. But men wrote the longest messages. Women interacts most with the other gender. Men do ask slightly more questions than Women. SWOOP can also do network analysis for groups or compare men and women. Cai had done the latter and conclude, that women generally have better networks. Probably because they interact more with the other gender than men. The network analysis can also be used to see cross team collaboration. Cai recommended that you teach the employees to do three likes and two comments for each post they write. Cai Kjaer is the co-founder/CEO of SWOOP Analytics and co-founder of Optimice. 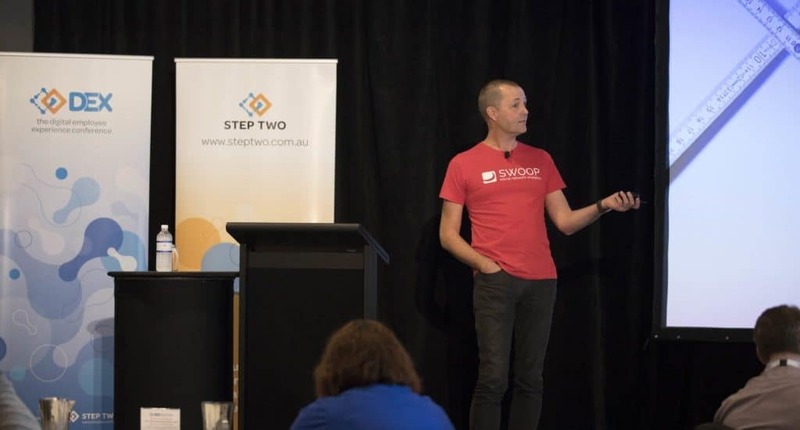 SWOOP is a leading enterprise social network analytics platform that uses data from Microsoft Yammer and Workplace by Facebook to help organisations and their people to become better collaborators. Cai maps collaboration patterns within and between organisations. Also a highly experienced Organisational Change practitioner, he has led organisations through large and complex business transformation projects. Will we see you at IntraTeam Event Stockholm Oct. 2-4, 2018 – The conference about international intranets and digital workplaces with great employee experiences for the whole intranet and digital workplace team. Which Microsoft Collaboration tool to use when?